New in New jacket. Mint condition. Bloomsbury, 2017. 20th Anniversary Edition. First UK edition-2nd printing of this 20th anniversary edition (3 5 7 9 10 8 6 4 2). Black hardback (purple lettering to the spine) with Dj(two small nicks and crease on the edges of the Dj cover), both in mint condition. Illustrated with b/w drawings, map. The book is new. Illustrations by Levi Pinfold. 359pp including Ravenclaw: An Introduction, J.K. Rowling-Twenty Years of Magic, Price un-clipped. This is another paragraph Book Description: Celebrate 20 years of Harry Potter magic with four special editions of Harry Potter and the Philosopher's Stone. Gryffindor, Slytherin, Hufflepuff, Ravenclaw. Twenty years ago these magical words and many more flowed from a young writer's pen, an orphan called Harry Potter was freed from the cupboard under the stairs-and a global phenomenon started. Harry Potter and the Philosopher's Stone has been read and loved by every new generation since. To mark the 20th anniversary of first publication, Bloomsbury is publishing four House Editions of J.K. Rowling's modern classic. These stunning editions will each feature the individual house crest on the jacket and line illustrations exclusive to that house, by Kate Greenaway Medal winner Levi Pinfold. Exciting new extra content will include fact files and profiles of favourite characters, and each book will have sprayed edges in the house colours. Available for a limited period only, these highly collectable editions will be a must-have for all Harry Potter fans in 2017. New in New jacket. Mint condition. Bloomsbury, 2017. 20th Anniversary Edition. First UK edition-first printing of this 20th anniversary edition (1 3 5 7 9 10 8 6 4 2). Black hardback (purple lettering to the spine) with Dj(two small nicks and crease on the edges of the Dj cover), both in mint condition. Illustrated with b/w drawings, map. The book is new. Illustrations by Levi Pinfold. 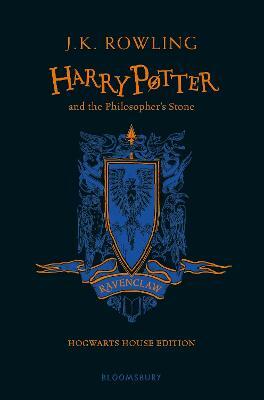 359pp including Ravenclaw: An Introduction, J.K. Rowling-Twenty Years of Magic, Price un-clipped. This is another paragraph Book Description: Celebrate 20 years of Harry Potter magic with four special editions of Harry Potter and the Philosopher's Stone. Gryffindor, Slytherin, Hufflepuff, Ravenclaw. Twenty years ago these magical words and many more flowed from a young writer's pen, an orphan called Harry Potter was freed from the cupboard under the stairs-and a global phenomenon started. Harry Potter and the Philosopher's Stone has been read and loved by every new generation since. To mark the 20th anniversary of first publication, Bloomsbury is publishing four House Editions of J.K. Rowling's modern classic. These stunning editions will each feature the individual house crest on the jacket and line illustrations exclusive to that house, by Kate Greenaway Medal winner Levi Pinfold. Exciting new extra content will include fact files and profiles of favourite characters, and each book will have sprayed edges in the house colours. Available for a limited period only, these highly collectable editions will be a must-have for all Harry Potter fans in 2017. Very Good. Harry Potter and the Philosopher's Stone-Ravenclaw Edition by Rowling, J.K., 2017-06-01. 368 p. Intended for a juvenile audience. New. 368 p. Intended for a juvenile audience.